A single species is recognized in the genus. Taningia danae reaches a maximum of 170 cm ML (Nesis, 1981/87). In T. danae tentacles are reduced to minute appendages in young subadults and are absent in adults. The second arms carry large, lidded photophores at the arm tips. Figure. Dorsolateral view of T. danae, 60 mm ML, Hawaiian waters. Photograph by R.Young. with large photophores at the tips of arms II; other arms without arm-tip photophores. 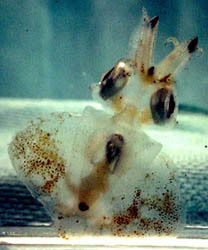 Tentacles reduced to minute appendages in young subadults; absent in later stages. Tips of Arms II modified into broad photophores with muscular lids. Figure. The large arm II photophore of T. danae. 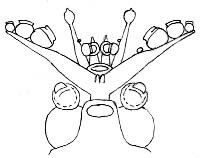 Left - Oral view of the brachial crown showing the large, dark photophores at the tips of arms II. 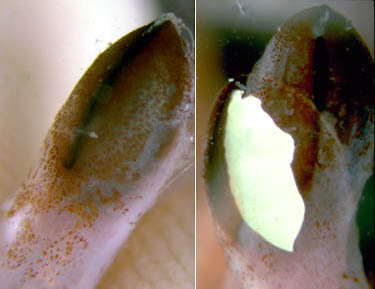 Right - Two pictures showing aboral views of an arm tip photophore. The first shows the photophore lids closed. The second is a double photographic exposure that shows, with one exposure, the lids withdrawn (open) revealing the white surface of the photophore, and the lids closed with the other exposure. Photographs by R. Young and C. Roper. Pair of photophores present on viscera. The visceral photophores are very hard to locate in preserved specimens. O. persica Naef, 1923 is a paralarva of Taningia (Young, 1972), presumably, T. danae. Roper and Vecchione (1993) reported observations on bioluminescence in a 60 mm ML squid from Hawaiian waters. When disturbed, Taningia would attack and repeatedly flash the arm-tip photophores. The flash duration was generally only a fraction of a second; however on some occasions the arm tip glowed for periods of about 1-7 seconds. The aggressive flashing behavior is presumably used to startle predators via a mock attack. In addition, the visceral photophores were observed to glow for periods in excess of 15 min. and produced a general ventral glow. This latter behavior is suggestive of a counterillumination function (Roper and Vecchione, 1993). The photograph below left shows the squid on which these observations were made. The chromatophores are contracted on the midventral mantle skin which leaves a "window" for bioluminescent light from the viscera to emerge. The reflective photophores can be seen as a white streak. The photograph, below right, is from a different specimen that has the mantle cut open showing the visceral photophores. Figure. Left - Ventral view of T. danae, 60 mm ML squid, Hawaiian waters. Photograph by R. Young and C. Roper. Right - Ventral view of visceral photophores of a young T. danae seen through a cut in the ventral mantle. Photograph by M. Vecchione. T. danae has been observed with a baited underwater camera in its natural habitat off the Ogasawara Islands in the western North Pacific (Kubodera, et al., 2006). The squid was photographed at depth of 240-940 m overall and at 614 and 940m depth at 0800 -0900 hrs, at 900 m at 1600 hrs, mainly at 500-600 m around sunset (1700-1900 hrs) and at 240-650 m at night (2000-2300 hrs). The squid swam using the large fins. Large amplitude waves in the fins passing from head to tail propelled the squid forward and reverse waves propelled it backwards. 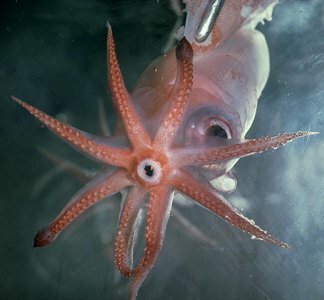 On several occasions a squid of over 1 m total length was seen to actively attack the bait, attaining swimming speeds of 2-2.5 m/sec during the approach. Insitu bioluminescence was also photographed by Kubodera, et al. (2006). 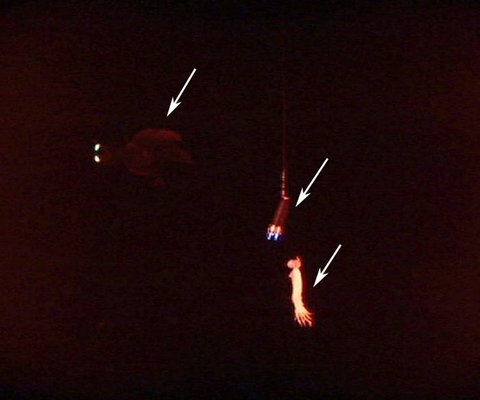 The arm II photophores were seen to flash (< 2 seconds duration) as the squid attacked the bait with spread arms. The photophores were also seen to produce long-term glows (ca. 4-9 sec.) without attacking the bait, although swimming near the bait then extinguishing the light as the squid swam away. The function of the latter luminescence is uncertain. This behaviour was seen only when the two halogen lights adjacent to the camera were covered with red filters. 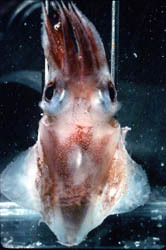 Without the distracting large halogen lights visible, perhaps the squid interpreted the two dim lights hung above the bait as bioluminescence from another Taningia and its own glow was an attempt to communicate (e. g., "This is my prey") but without an appropriate response, the squid moved on (Kubodera, et al., 2006). T. danae is a known, and probably important, component of the diet of the sperm whale (eg, (Clarke, 1967; Okutani & Satake, 1978). T. danae can be swallowed whole to at least 32 cm ML (T. K., personal observations) but larger ones, judging from the following account, must be torn up before swallowing. Underwater observations and photographs of sperm whales feeding on squid are rare. 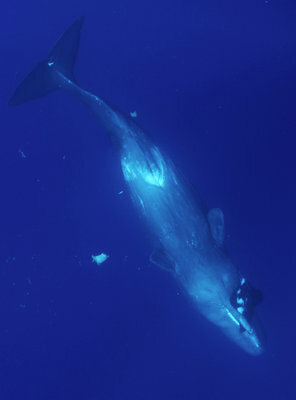 According to a report written by the observers Wade and Robyn Hughes, Wayne and Pam Osborn, and Tania Windsor Blunden (personal communication): A young male sperm whale, about six to seven meters in length, surfaced off Faial in the Azores with a large squid in its jaws. Initially the whale "appeared to have ... taken [the squid] head on, with [the squid's] swimming fins hanging symmetrically down each side of the whale’s jaws." "After swimming on or near the surface for about ten minutes with the squid held in its jaws, the whale sank slowly on its side, and then on its back convulsively chewing and snatching at the squid’s carcass." In the picture below, on the right, fragments of the squid float near the whale indicating the "sloppy feeding" seen by the observers. They estimated the squid's width from fin tip to fin tip as 1.5 to 2 m; this width would approximate the squid's mantle length. Figure. 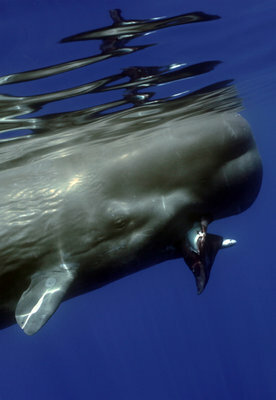 Sperm whale eating a squid, probably Taningia danae, photographed off the island of Faial in the Azores. Left - Recently surfaced sperm whale and squid. Right - Later photograph in which the whale has a different grasp of the squid and fragments of the squid are floating nearby. Photographs taken by Wade and Robyn Hughes while free diving (i.e., without scuba gear). The paralarva is distinctive in having enlarged suckers on the thick tentacles and the tips of arms II swollen by the developing photophores. Figure. Ventral view of the head of a paralarval T. danae, Hawaiian waters, mantle was missing. Drawing by R. Young. Figure. Dorsal and oral views of a paralarva of T. danae, Gulf of Aden, 4.7 mm ML. Drawings from Chun, 1910. 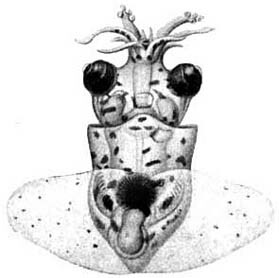 This is the paralarva that Naef (1923) named Octopodoteuthopsis persica. The juvenile T. danae (photographs below) can be quite translucent although the armtip photophores are heavily pigmented. The eyes are large, and the central brain and optic lobes (yellow) occupy a posterior position in the head, leaving a long anterior esophagus passing to the buccal mass. Figure. Ventral (left) and dorsal-oblique views of a juvenile T. danae, ca. 10-20 mm ML, Hawaiian waters. Photograph by R. Young. The type locality is off the Cape Verde Islands. The distribution includes the tropical and temperate regions of all oceans and boreal waters of the North Atlantic (Roper and Vecchione, 1993). Chun, C. 1910. Die Cephalopoden. Oegopsida. Wissenschaftliche Ergebnisse der Deutschen Tiefsee-Expedition, "Valdivia" 1898-1899, 18: 1-522 + Atlas. 1931. Symp. Zool. Soc. Lond. 19, 127–143. Kubodera, T. , Y. Koyama and K. Mori. 2006. Observations of wild hunting behaviour and bioluminescence of a large deep-sea, eight-armed squid, Taningia danae. Proc. R. Soc. B, 2006.0236 . Published online. Naef, A. (1921/23). 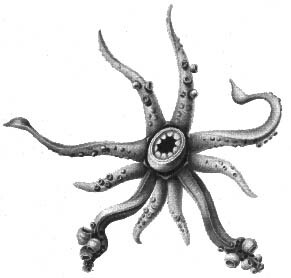 Cephalopoda. Fauna und Flora des Golfes von Neapel. Monograph, no. 35. English translation: A. Mercado (1972). Israel Program for Scientific Translations Ltd., Jerusalem, Israel. 863pp., IPST Cat. No. 5110/1,2. February 1977. Bull. Tokai Reg. Fish. Res. Lab. 93, 13–27. Roper, C. F. E. and M. Vecchione. 1993. A geographic and taxonomic review of Taningia danae Joubin, 1931 (Cephalopoda: Octopoteuthidae), with new records and observations on bioluminescence. P. 441-456. In:: T. Okutani, R. K. O'Dor and T. Kubodera (eds.). The Recent Advances in Cephalopod Fishery Biology. Tokai University Press. Tokyo. Large squid lights up for attack. BBC News. from Roper, C. F. E. and M. Vecchione. 1993. A geographic and taxonomic review of Taningia danae Joubin, 1931 (Cephalopoda: Octopoteuthidae), with new records and observations on bioluminescence. P. 441-456. In: T. Okutani, R. K. O'Dor and T. Kubodera (eds.). The Recent Advances in Cephalopod Fishery Biology. Tokai University Press. Tokyo. Page: Tree of Life Taningia Joubin 1931. Taningia danae Joubin 1931. Authored by Michael Vecchione, Tsunemi Kubodera, and Richard E. Young. The TEXT of this page is licensed under the Creative Commons Attribution-NonCommercial License - Version 3.0. Note that images and other media featured on this page are each governed by their own license, and they may or may not be available for reuse. Click on an image or a media link to access the media data window, which provides the relevant licensing information. For the general terms and conditions of ToL material reuse and redistribution, please see the Tree of Life Copyright Policies.